Will the Ewoks be making their return to a galaxy far, far away in the not-too-distant future? Ever since Disney purchased Lucasfilm back in 2012, it always seemed likely that they would mine the vast Star Wars universe in order to find content that was geared toward a younger audience. With the Disney+ streaming service on the way, that seems more certain than ever and now, a new rumor suggests that they're going to turn to the fuzzy little murder bears from Endor in order to accomplish just that. Before digging in, we must caution that this information isn't coming directly from Lucasfilm, or anyone related to the alleged project directly. With that, it should be regarded as nothing more than a rumor for the time being. 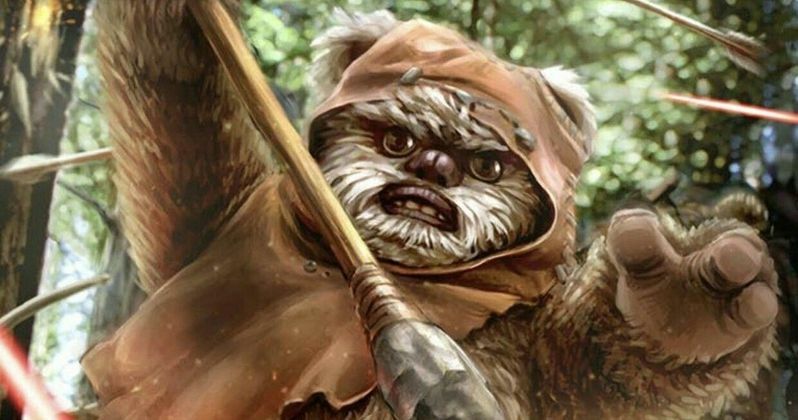 That having been said, a new report claims that an Ewoks series is in the works for Disney+. It wasn't specified if this would be live-action or animated. The idea is that this would be aimed at younger viewers and would not be part of the first round of Star Wars shows being made for the service, which includes The Mandalorian, the Rogue One prequel series centered on Cassian Andor and a new season of The Clone Wars animated series. Instead, this would be part of the second wave of Star Wars shows that would help lure in subscribers, which the report claims will happen 12 to 18 months after the initial launch. Disney+ will launch later this year, likely in the fall, with The Mandalorian set to be the first of these shows to arrive. That means this Ewoks show wouldn't arrive until late 2020 or early 2021. So it certainly seems to be in the earlier stages of its development and a lot could change between now and then. The little furry creatures who inhabit the forest moon of Endor were first introduced in Return of the Jedi. They helped the Rebels overthrow the Empire and have an important place in Star Wars history. They've also been a point of contention amongst the fanbase. Many see them as one of the worst elements of the original trilogy, while others embrace them, or at least tolerate them. And again, they did murder tons of Stormtroopers with blunt weapons and they definitely eat people. There's some darkness there when the layers are peeled back. This wouldn't be the first time the Ewoks have come to the small screen. The creatures starred in a pair of made for TV movies (which are no longer canon) with 1984's The Ewok Adventure and 1985's Battle for Endor. ABC also aired an Ewoks animated series starting in 1985 that ran for two seasons. For what it's worth, in the Disney era, they were brought back for a special game mode in Battlefront II, which involves the Ewoks brutally hunting down Imperial troopers under cover of night on Endor. We'll be sure to keep you posted as any further details on this project are made available. This news was first reported by Moviehole.